Recall 102715 started on 06/19/2013 by ODI effecting 1,560,000 units. Recall 102716 started on 06/19/2013 by ODI effecting 1,560,000 units. Recall 85897 started on 05/11/2009 by OVSC effecting 42,540 units. Recall 83553 started on 04/07/2009 by OVSC effecting 16,270 units. Recall 60984 started on 03/23/2006 by OVSC effecting 61,944 units. Recall 2968 started on 02/15/2002 by ODI effecting 1,620,000 units. Summary: ON CERTAIN SPORT UTILITY VEHICLES, IF A DRIVER HAS NOT PLACED THE SHIFTER LEVER FULLY INTO THE "PARK" POSITION AND LEAVES THE VEHICLE RUNNING, THE VEHICLE MAY UNEXPECTEDLY MOVE REARWARD AFTER SEEMING TO BE STABLE. Consequence: INADVERTENT MOVEMENT OF THE VEHICLE COULD RESULT IN A CRASH. Remedy: DEALERS WILL INSTALL A SECONDARY DETENT SYSTEM TO THE FLOOR SHIFTER ASSEMBLY. DAIMLERCHRYSLER SENT INTERIM NOTICES TO OWNERS CONCERNING THIS PROBLEM ON MARCH 22, 2002. OWNER NOTIFICATION BEGAN SEPTEMBER 23, 2002. OWNERS WHO TAKE THEIR VEHICLES TO AN AUTHORIZED DEALER ON AN AGREED UPON SERVICE DATE AND DO NOT RECEIVE THE FREE REMEDY WITHIN A REASONABLE TIME SHOULD CONTACT DAIMLERCHRYSLER AT 1-800-853-1403. Recall 10408 started on 01/12/1998 by ODI effecting 293,369 units. Summary: VEHICLE DESCRIPTION: PASSENGER AND MULTI-PURPOSE VEHICLES ORIGINALLY SOLD OR CURRENTLY REGISTERED IN THE STATES OF CONNECTICUT, ILLINOIS, INDIANA, MAINE, MARYLAND, MASSACHUSETTS, MICHIGAN, NEW HAMPSHIRE, NEW JERSEY, NEW YORK, OHIO, PENNSYLVANIA, RHODE ISLAND, VERMONT, OR WISCONSIN, AND THE DISTRICT OF COLUMBIA. THE FRONT DISC BRAKE ROTORS CAN EXPERIENCE SEVERE CORROSION IF OPERATED FOR AN EXTENSIVE PERIOD IN THE "SALT BELT." IF THE ROTORS ARE NOT REPLACED, THE CORROSION CAN EVENTUALLY COMPROMISE THE STRUCTURAL INTEGRITY OF THE STAMPED STEEL CENTER HUB SECTION OF THE ROTOR. Consequence: THE REDUCED STRENGTH CAN ALLOW THE CAST IRON WEAR SURFACE TO SEPARATE FROM THE HUB, REDUCING THE BRAKE EFFECTIVENESS OF THE VEHICLE. Remedy: DEALERS WILL REPLACE THESE ROTORS WITH ROTORS THAT ARE COATED WITH A CORROSION PROTECTION. Notes: OWNER NOTIFICATION BEGAN MARCH 9, 1998.OWNERS WHO TAKE THEIR VEHICLES TO AN AUTHORIZED DEALER ON AN AGREED UPON SERVICE DATE AND DO NOT RECEIVE THE FREE REMEDY WITHIN A REASONABLE TIME SHOULD CONTACT CHRYSLER AT 1-800-992-1997.ALSO CONTACT THE NATIONAL HIGHWAY TRAFFIC SAFETY ADMINISTRATION'S AUTO SAFETY HOTLINE AT 1-888-DASH-2-DOT (1-888-327-4236). Recall 12680 started on 05/02/1997 by ODI effecting 1,010,400 units. Summary: VEHICLE DESCRIPTION: MULTIPURPOSE PASSENGER VEHICLES EQUIPPED WITH AUTOMATIC TRANSMISSIONS. THIS IS NOT A SAFETY RECALL IN ACCORDANCE WITH FEDERAL REGULATION 573. HOWEVER, IT IS DEEMED A SAFETY IMPROVEMENT CAMPAIGN BY THE AGENCY. DRIVERS CAN MISTAKENLY STEP ON THE ACCELERATOR PEDAL WHEN THEY INTEND TO STEP ON THE BRAKE PEDAL. Consequence: PEDAL MISAPPLICATION BY A DRIVER CAN CAUSE UNINTENDED ACCELERATION. Remedy: DEALERS WILL INSTALL A SHIFT INTERLOCK ON THE AUTOMATIC TRANSMISSION OF THESE VEHICLES. Notes: NOTE:CHRYSLER HAS DECIDED TO CONDUCT A SAFETY IMPROVEMENT CAMPAIGN TO INSTALL A SHIFT INTERLOCK ON THESE VEHICLES.OWNERS CAN CONTACT CHRYSLER AT 1-800-853-1403. Recall 19383 started on 12/13/1993 by ODI effecting 115,000 units. Summary: THE MOLDED PLASTIC PIN WHICH CONNECTS THE UPPER STEERING COLUMN SHAFT AND THE LOWER COLUMN SHAFT MAY HAVE BEEN SHEARED PRIOR TO INSTALLATION OF THE STEERING COLUMN ASSEMBLY INTO THE VEHICLE. IF THIS OCCURRED, THE UPPER STEERING SHAFT WILL SEPARATE FROM THE LOWER STEERING SHAFT. Consequence: IF THE UPPER AND LOWER STEERING SHAFTS SEPARATE, COMPLETELOSS OF STEERING CONTROL WILL OCCUR, WHICH COULD RESULT IN AN ACCIDENT. Remedy: A RESTRAINING SLEEVE WILL BE ADDED TO THE INTERMEDIATE SHAFT TO LIMIT THE AMOUNT OF STEERING SHAFT MOVEMENT AVAILABLE. Notes: SYSTEM: STEERING; COLUMN SHAFT; UPPER.VEHICLE DESCRIPTION: MULTIPURPOSE PASSENGER VEHICLES.NOTE: IF YOU HAVE A PROBLEM OBTAINING THE NEEDED REPAIR, PLEASE CONTACT THECHRYSLER ZONE OFFICE IN YOUR AREA. IT IS LISTED UNDER "SERVICE ASSISTANCE" INYOUR OWNER'S MANUAL. A ZONE REPRESENTATIVE WILL ARRANGE FOR PROMPT ATTENTION TOYOUR VEHICLE. ALSO CONTACT THE NATIONAL HIGHWAY TRAFFIC SAFETY ADMINISTRATION'SAUTO SAFETY HOTLINE AT 1-800-424-9393. Recall 19291 started on 04/08/1993 by ODI effecting 80,000 units. Summary: GREASE APPLIED TO THE LIFTGATE LATCH RUBBER BUMPERS TO EASE COMPONENT ASSEMBLY CAUSED THE BUMPER TO SWELL, INTERFERING WITH THE MOVEMENT OF THE LIFTGATE LATCH PAWL. THIS PREVENTS THE LIFTGATE LATCHING WHEN CLOSED AND DIFFICULT TO OPEN WHEN LATCHED. Consequence: AN UNLATCHED LIFTGATE CAN OPEN WHILE THE VEHICLE IS INMOTION, AND COULD RESULT IN AN OCCUPANT FALLING OUT. Remedy: REPLACE THE LIFTGATE ASSEMBLY ON AFFECTED VEHICLES. 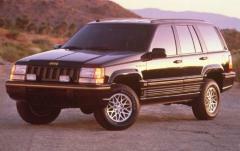 Notes: SYSTEM: STRUCTURE; LIFT GATE.VEHICLE DESCRIPTION: UTILITY VEHICLES; MODEL GRAND CHEROKEE AND GRAND WAGONEER. Recall 19284 started on 04/02/1993 by MFR effecting 25,000 units. Summary: THE ECCENTRIC CAM ADJUSTER BOLTS IN BOTH FRONT LOWER SUSPENSION ARM-TO-FRONT AXLE BRACKET ATTACHMENTS MAY FAIL DUE TO ASSEMBLY MISALIGNMENT. Consequence: CAM BOLT FAILURES CAUSE THE VEHICLE TO PULL TO ONESIDE WHEN THE BRAKES ARE APPLIED, RESULTING IN A POSSIBLE LOSS OF VEHICLECONTROL AND AN ACCIDENT. Remedy: REPLACE THE FRONT SUSPENSION CAM BOLTS, CAM WASHERS, AND NUTS WITH COMPONENTS OF A DIFFERENT DESIGN. Notes: SYSTEM: FRONT SUSPENSION.VEHICLE DESCRIPTION: SPORT UTILITY VEHICLES. Recall 20871 started on 12/14/1992 by MFR effecting 600 units. Summary: THE RETAINER CLIP WHICH SECURES THE MASTER CYLINDER INPUT ROD TO THE BRAKE PEDAL WAS NOT INSTALLED PROPERLY, AND COULD WORK LOOSE. Consequence: DISENGAGEMENT OF THE RETAINER CLIP WILL ALLOW FREE PLAYIN THE ATTACHMENT AND CAN ALLOW THE INPUT ROD TO SEPARATE FROM THE BRAKE PEDALCAUSING COMPLETE LOSS OF BRAKE APPLICATION WHICH COULD RESULT IN AN ACCIDENT. Remedy: IMPROPERLY INSTALLED RETAINER CLIPS WILL BE REMOVED AND NEW RETAINER CLIPS WILL BE PROPERLY INSTALLED. 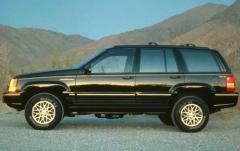 Notes: SYSTEM: BRAKES.VEHICLE DESCRIPTION: GRAND CHEROKEE AND GRAND WAGONEER UTILITY VEHICLES. Recall 14496 started on by OVSC effecting 224,642 units. Summary: THIS IS NOT A SAFETY RECALL IN ACCORDANCE WITH FEDERAL REGULATION 573. HOWEVER, IT IS DEEMED A SAFETY IMPROVEMENT CAMPAIGN BY THE AGENCY. THE CENTER REAR SEAT BELT BUCKLE MAY NOT BE ACCESSIBLE WHEN THE RIGHT (PASSENGER) SIDE OF THE REAR SEAT BACK IS FOLDED DOWN IN THE CARGO STOWAGE POSITION. Consequence: IN THE EVENT OF A COLLISION, THE OCCUPANT OF THE CENTER REAR SEAT MAY NOT BE PROPERLY RESTRAINED AND PERSONAL INJURY COULD OCCUR. Remedy: DEALERS WILL REPLACE THE SEAT BELT BUCKLE ASSEMBLY. Notes: NOTE:CHRYSLER HAS DECIDED TO CONDUCT A SAFETY IMPROVEMENT SERVICE CAMPAIGN TO REPLACE THE SEAT BELT BUCKLE ASSEMBLY WITHOUT CHARGE.OWNERS CAN CONTACT CHRYSLER AT 1-800-853-1403.